In love, truth and blessings, I, Archangel Michael, extend my energy to synthesise with yours. We are all one in the Universe of the Creator. We all hold the key to unlock the truth of the Creator, bringing the truth into our awareness, expression and actions. The truth is present within all souls and each soul can access the complete and whole truth of the Creator. There are no limits to the abundant and expansive nature of the Creator’s truth, therefore there are no limits to you accessing the Creator’s truth. Imagine an energy or consciousness that is far more expansive than you could ever envisage. It holds everything you wish to understand and so much more. Imagine that you have the ability to embody this energy or consciousness and understand it completely. This is the truth of the Creator. It is your divine right to accept and acknowledge the complete truth of the Creator in your current embodiment. I, Archangel Michael, wish to empower you to realise that all you seek is within you and can be accessed through your choosing. Cleansing and purifying your being supports openings within you which direct you to choosing to access new wisdom and understandings. But often it is not the holding onto certain energies or blockages that hinder your awareness of the truth of the Creator within you, instead it is your choosing to distract yourself. When you choose to see, sense and acknowledge the truth of the Creator in every moment of your reality then you create a powerful promise to yourself and an unwavering alignment with the truth of the Creator. Your promise is to realise when you are distracting yourself, if something requires to be healed, then instigate the necessary acts for healing to take place. Let yourself be focused and alert in the needs of your being, when shifts are required and when healing is essential. This will mean that you are able to remain in the space of your promise to yourself of choosing to see, sense and acknowledge the truth of the Creator. This way new openings of truth will manifest from within your being and you will more easily access the complete truth of the Creator. The Earth is a planet devoted to creation, every soul who comes to the Earth enrols in the processes of creating; learning and remembering how to create their existence and the world from the source of all that is the Creator. This means that your purpose on the Earth is to create for yourself that which you choose you create, and also to support others. When you choose to see, sense and acknowledge the truth of the Creator in every moment of your reality, you are empowering yourself and your ability to create. You become a creator, you manifest and express the truth on the Earth. This is immensely powerful, as you can create infinite possibilities because the truth of the Creator is infinite. It is important to hold the understanding that you have access to and can receive and embody the whole and complete truth of the Creator. With this knowledge you become powerful and open to receive all that is available to you. There is a second important understanding to accept and acknowledge which is that you have a purpose of bringing forth certain aspects, qualities, wisdom and knowingness through your being from the source of the Creator. It is your purpose not only to align with the whole and complete truth of the Creator, but also to express your purpose through your being an aspect of the truth of the Creator that is relevant to and aligned with your incarnations. These two purposes are different, they offer you access to the power of the wholeness and completeness of the Creator while allowing you to realise you can focus on delivering a small portion of the truth through your being and into your reality, which will feel like a mammoth expression. It is not for you to express the whole truth, simply what is relevant for your current incarnation. Your soul came to the Earth to remember and experience an aspect, quality or experience with the Creator. You do not even need to know what it is your soul wants to remember and experience. By simply aligning with the whole and complete truth of the Creator you will allow yourself access to the truth that is essential for your existence now. It will flow to you and through you, inspiring your existence on the Earth. 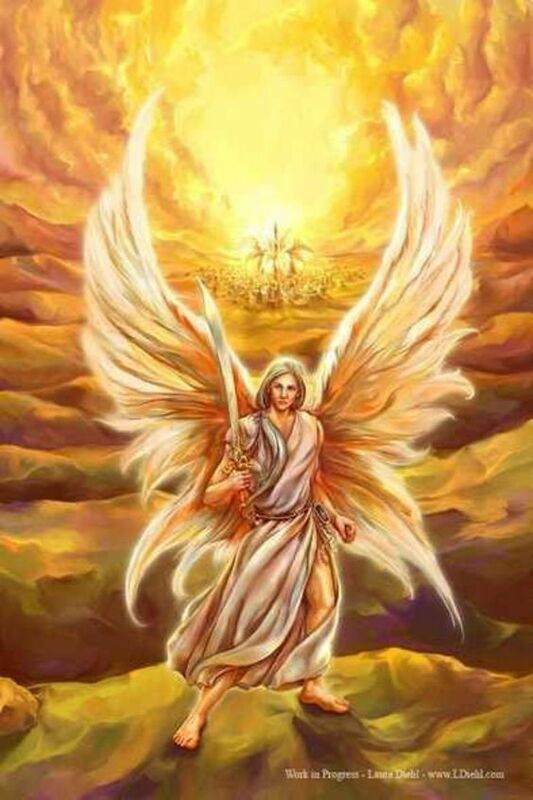 Invocation ‘Archangel Michael, I invite you to commune with my soul and please support me in connecting with the truth of the Creator that is most important for me to receive now to empower my being and reality, allowing me to exist in and as my purpose on the Earth. I am open to receive now. The negative ego did not come from God. It came from man’s misuse of free choice. Man is the only creature that has the ability to think out of harmony with God. The fall that the Bible refers to occurred when we as monads, or individualized spark of God, chose to come into matter. It wasn’t the coming into matter that caused the fall - but the over-identification with matter. It was that moment when we thought we were a physical body rather than a God-being inhabiting or using this physical body. In thinking we were a physical body, we fell prey to the illusion of separation from God and separation from our brothers and sisters. Then came selfishness, fear, and real death. From these faulty premises a whole thought system developed that was based on illusion, maya, and glamour. We have spent hundreds of incarnations caught up in this illusion. My parents turned 80 this year and I went back east for my mom's birthday. I'm sure I'll have more to share. I know in advance as I write this that it will be a beautiful visit. Video - "Affirmations: Activate The 7 Hermetic Principles Of Wisdom & Power"
Thanks so much for sharing Elisabeth. Here are a couple of things to help you with your studies and staying free from the 'dead ones', who are just disencarnated spirits who did not go into God's Light when they died. So what you can do when you see one is to call upon the angels to help this spirit go into the Light to their most divinely perfect place for them. And every day you also might want to call upon Archangel Michael to establish and maintain a Golden Net of Protection around you that keeps away from you all vibrations that are not of God's Light.